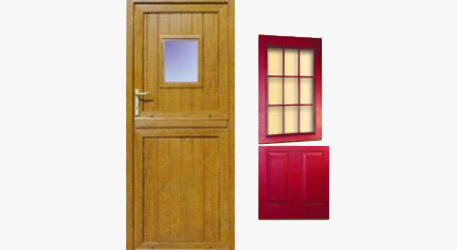 Our Stable Door has an appealing cottage style appearance with angled faces to dispel dirt and water. One of the door’s many features is the versatility of its high security hook lock. The top leaf can be opened independently to provide additional ventilation as required, with the bottom unit securely locked to contain children and pets. A stable door cottage style effect in your home. Due to a cleverly designed snapper catch that holds the two sections together, the door can also be used as a conventional single leaf, without the need for a complicated retaining mechanism. To permit a wide variety of applications, the stable door comes with a choice of three thresholds and in white, woodgrain, woodgrain on white, light oak and light oak on white finishes.